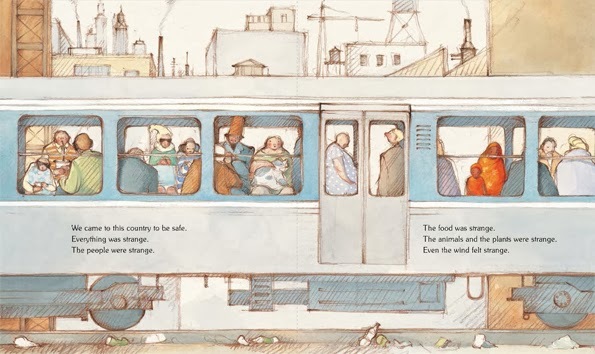 My Two Blankets is a stunningly powerful debut picture book about the experiences of immigrating to a new country by Irena Kobald. Kobald is a multilingual Austrian immigrant to Australia who teaches aboriginal children in Australian outback communities. The children she teaches use English as a fifth language. 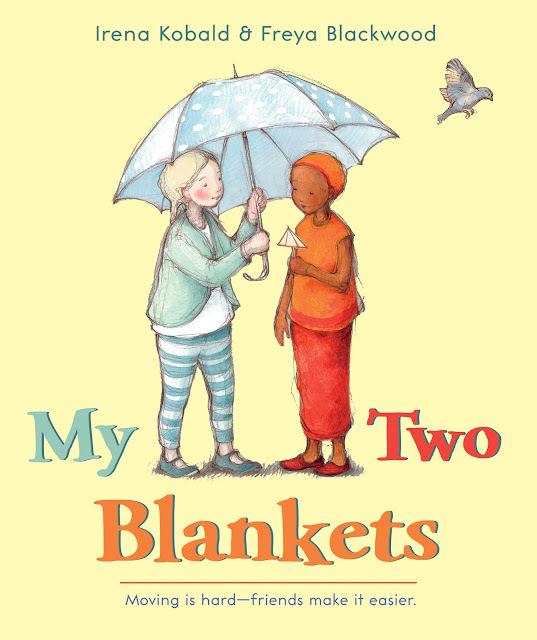 My Two Blankets was inspired by a friendship that developed between Kobald's daughter and a Sudanese child. Working in a school near the Mexican border, the majority of my students are immigrants or the children of immigrants. I have read My Two Blankets over and over to students from all grades and the way that Kobald and Blackwood bring this experience to the page resonates with them, whether it is their personal experience or not - it could be their parents' experience, their cousin's or their grandparents'. And, as someone who has never experienced this kind of challenge, Kobald and Blackwood made this experience immediately tangible for me as I read this amazing book. My Two Blankets is a book that needs to be in every school and every classroom in America, a country built on, but not always at peace with, cultural diversity and the immigrant experience. Kobald's text for My Two Blankets is poetic and sparse as she tells the story of a girl nicknamed Cartwheel by her Auntie. But after the war came, Auntie didn't call her Cartwheel anymore. Cartwheel says, "We came to this country to be safe. Everything was strange. The people were strange. The food was strange. The animals and the plants were strange. Even the wind felt strange." 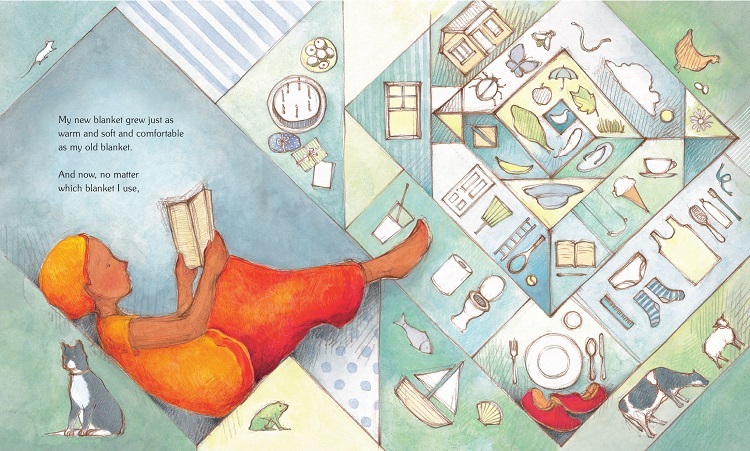 Freya Blackwood's magnificent illustrations also tell Cartwheel's story, from the opposing warm and cool color palettes she uses to represent Cartwheel's world and her new home, as well as her blankets, to the way she visually represents intangibles language barriers and the emotions that accompany them. As she walks through the streets with her Auntie, the strange languages and sounds Cartwheel hears appear as symbols and shapes flying about in a confusing muddle. Cartwheel says that when she goes out it is like "standing under a waterfall of strange sounds. The waterfall was cold. And it made me feel alone. I felt like I wasn't me anymore." 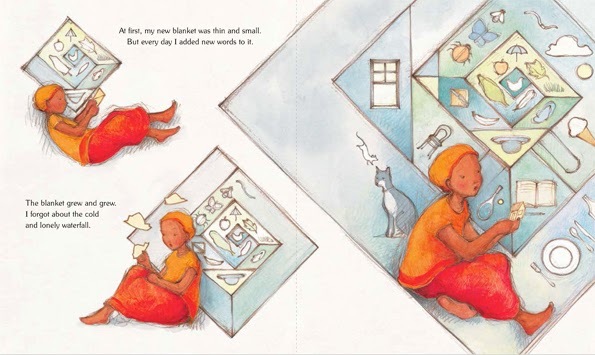 When Cartwheel is home, she says that she covers herself in a blanket of "my own words and sounds." 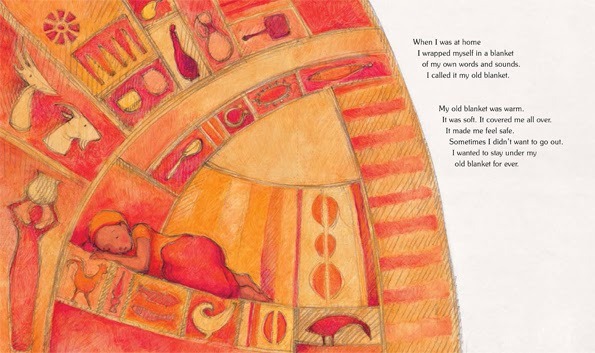 This blanket, like Cartwheel's clothes, are warm oranges, reds and yellows. The images on the blanket were from her homeland and made her feel safe. When she was wrapped in its warmth, she felt safe and "didn't want to go out. I wanted to stay under my old blanket forever." But she does go out and one day, at the park, a girl waves and smiles at her. The girl is illustrated with pale blues, yellows and greens in opposition to Cartwheel's warm oranges and reds. Cartwheel is shy and she must return to the park three more times before she sees the girl again and works up the courage to smile back. However, even this new joyful friendship brings sadness for Cartwheel when she does not know the words to tell the girl that she is happy they are friends. But, as they spend more time together, the girl "brings some words for me. She made me say them over and over." Blackwood illustrates this beautifully, showing Cartwheel holding what looks like a paper bird, then a tree, then leaves, the girls trading them back and forth. Soon, inside Cartwheel's warm, comfortable old blanket we see a new blanket emerging, made from the cool colors of the girl and her world and the symbols that she shares with Cartwheel. After time, this new blanket becomes "just as warm and soft and comfortable as my old blanket. And now, no matter which blanket I use, I will always be me." The final illustration shows Cartwheel and her friend in the park, turning cartwheels. 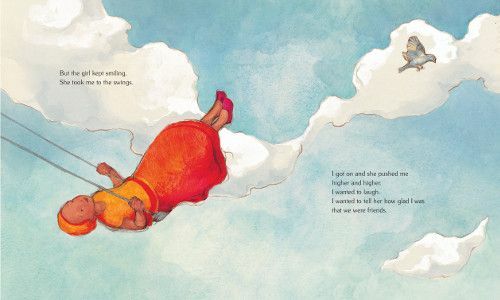 With My Two Blankets Kobald and Blackwood have created a book that makes cultural displacement, loneliness and sadness immediately palpable and graspable for children. At the same time, they have given us a book about patience, perseverance, friendship, sharing and kindness that will leave you feeling that same burst of joy that completing a cartwheel can give you.